A trip to Mexico had been on the cards for a number of years. The sheer wealth of species in that land makes it one of the world’s hot spots for plant diversity. The reasons for this are partly because of the fascinating and ever changing topography, and the subsequent differing climatic conditions. Many people seem to have the idea that it is purely a country of never ending semi-desert, but, though a fair proportion of the land is of that type, nothing could be further from the truth. Whilst traversing the Sierra Madre Oriental in the East of this huge country, one can literally be in steamy tropical jungle one moment, and half an hour of exhilarating driving later you are in semi-arid desert admiring mighty Agaves and ancient barrel Cacti. So in early November 2004 I set off with two other companions to sample some of the botanical treasures of this wonderfully diverse country. We met up in Mexico City and soon started out South East from that rather polluted and chaotic city into Puebla state, predominantly to ascend the highest peak in the country; that of Pico de Orizaba, a mighty snow-capped volcano of classical proportions which dominates the landscape for huge distances around and stands at over 5700m. After a fascinating journey over the volcanoes to the south of Mexico city and down into the dry, semi-arid plains around Puebla, where great trees of Yucca filifera dotted the landscape, we headed on to our goal, climbing sharply off the parched plain as we turned east, up into the Sierra Madre Oriental and into very different, cloud forest vegetation. As we descended again we found ourselves very much in the humid tropics, surrounded by palms, bananas and sugar cane. One of the most striking elements of all the climate, and subsequent vegetation types we had experienced so far were the roadside weeds. Everywhere were great drifts of orange and yellow marigolds, Bidens and Cosmos, literally glowing in the autumn sunshine. Over a period of 3 days, using a slightly different route each day, we ascended Pico’ to a maximum of about 3100m with the aid of our Jeep. Obviously the flora changes quite considerably as one gains altitude, though even at the base of the mountain it is quite remarkable to be in the tropics yet surrounded by large Oaks, Planes, Alders and Liquidambars, admittedly festooned with epiphytes, such as many different species of Tillandsia, and with giant ferns (Lophosoria quadripinnata) and Alocasia at their feet, but set in a landscape of rolling fields; the trees growing in ‘parkland’ style, quite reminiscent of home. One Quercus species that grows near the town of Huatusco, the very rare Q. insignis, has acorns almost the size of a tennis ball! As one gains altitude on the various dusty tracks that connect the villages on the south east side of Pico’, the views over deep, forested gorges become ever more spectacular. As regards the larger trees, evergreen oaks of various types including the handsome Q. candicans, many probable hybrids, and Pines, usually the exquisitely beautiful Pinus patula are everywhere around, changing to P. ayacahuite and others at higher altitude. At just under 3000m we found ourselves amongst the ‘Sacred fir’ Abies religiosa and, higher still, in almost pure stands of Pinus hartwegii, the true alpine pine of Mexico. On this, the wetter side of the mountain, the diversity was tremendous. To name but a few of the exciting species seen over 3 days: Dahlia merckii and D. aff. tenuicaulis, Beschorneria yuccoides subsp. decosteriana in flower, Arbutus xalapensis, two very handsome Schefflera-like small trees known as Oreopanax echinops and O. xalapensis, Bomarea hirtella, various Eryngium species including E. proteiflorum and deppeanum, Philadelphus mexicanus and an absolute plethora of epiphytic Bromeliads and ferns, including Tillandsia violacea. It was a surprise to find the huge glaucous rosettes of Agave atrovirens var. mirabilis in full flower in a village at about 2500m. It was being employed as a hedgerow plant and very likely also tapped for Pulque, the delicious alcoholic beverage so loved by the natives. The leaves reached 2m long making the rosettes sometimes over 4m across at flowering, and the inflorescences were approximately 10m tall. This Agave is one of only a handful of species known to occur over 3000m alt. and considering the plants it was growing alongside, and the cool, moist, montane climate prevalent in this area, it would be interesting to try it outside in a suitable position in mild parts of the UK. Plants are occasionally grown outside in southern Europe but they are rare. In contrast, the next main area we explored was the neighbouring volcano Cofre de Perote. This time we approached from the north, and the difference could not be starker. Although heavily forested with oaks and pines, it was much drier with a distinct lack of epiphytes. Under the trees a mass of blue flowered lupins often appeared, and in the dusty pine needle litter Eryngium proteiflorum revelled. Wonderful views were enjoyed over the dry plains to the north west. The Sierra de Chiconquiaco, 30 miles or so to the north east, proved to be a very rich area botanically, also one of cows and green fields. It is an off shoot of the Sierra Madre Oriental, heading out towards the Gulf of Mexico, and consequently humid and well watered. Tree ferns of the genus Cyathea made very handsome, slim trunked specimens under the tall evergreen oaks and Liquidambars, a few of the latter wore particularly fine colours for autumn, being a rich red-purple; better than we saw anywhere else. This is apparently the area were the late Jim Russell discovered Mahonia russellii, a plant that has proven fairly hardy so far in cultivation in the UK. By the vegetation present and the altitude reached, it is hard to believe such plants would survive our winters, indeed all the more reason to continue ignoring the text books and keep experimenting in the garden. After a period admiring the tropical delights of low altitude Veracruz, we turned back west and up again into the SMO. Whilst passing through many of the towns and villages, we kept seeing the giant Dahlia imperialis grown as an ornamental. However, these were not the ordinary form, but one where the sugar-pink flowers were fully double. Not really my cup of tea, but arresting nonetheless when one considers the woody stems towering to a height of about 3m or more were actually herbaceous. Another common Dahlia, often seen in gardens and on field edges growing to a height of 2 to 3m, was what we believed to be D. tenuicaulis. It was encountered as either the wild form with large, single, purple-pink flowers, or one where there were either double or single flowers on the same plant. Travelling through the back country of N Puebla one evening, we found our way was blocked by a landslide. Not a small landslip, but one of humungous proportions, involving hundreds of tons of rock. This was not induced by the powers of nature, rather that of some overzealous road widening team. The complete lack of ‘Health and Safety’ controls was both alarming and refreshing. As we waited, the men cleared a vehicle width path through the debris with their bulldozers as huge metre wide rocks occasionally dislodged themselves and hurtled past the machinery. We were called on after 10 minutes wait and did not stop to enjoy the view. The next morning we were to find a whole hillside of Brahea dulcis. This very handsome but variable Mexican palm was exceptionally beautiful in this area. It was making multi-stemmed low clumps and the rigid blue-green leaves were shimmering in the warm breeze. Around them grew Agaves, Salvias and Cheilanthes ferns. It is always a shock to find ferns in such a dry habitat and on a rocky sun baked slope, but that’s what many species of Cheilanthes seem to tolerate for many months of the year. North we pushed, zig-zagging across the mountains from dry to wet enjoying the striking changes in ecosystem, though also the subtle changes in vegetation the further north we went. To be recommended is the Mi Ranchito hotel in Xicotepec de Juarez. We were told of this atmospheric (and very moist) place by the boys from Yucca Do Nursery in Texas, and it is certainly a place I would make a detour to visit again. It is like stepping back into the 1950’s (not that I have much personal experience of that period) and certainly not what we were becoming used to as regards Mexican accommodation. The gardens were full of mature oaks, well trunked Cyathea, and great lines of the Chinese Cunninghamia lanceolata marking the boundaries. Let’s hope this place stays open long into the future. Although Mi Ranchito had its charms, nothing really made up for the disturbance caused every night by the hideous racket produced by Mexican traffic, especially that of heavy lorries, which seemed to increase in the wee hours. Their seemingly un-silenced exhausts and horrifically loud engine-braking was a nightmare to behold, especially for the sensitive nature lover! To add insult to injury, we were woken for the last time that night as morning broke by gun shots nearby. Was it the bandidos we were so often warned we might come across in Mexico? I very much doubt it. We saw virtually nothing untoward during the whole trip. More likely a little pest control. So, again we aimed to head north, this time by first heading west and down into the desert, and Hidalgo State. The contrast with the cloud forest we had just left behind was, as ever, spectacular. We stopped for a break amongst at least three different Opuntia species, Agave lechuguilla, huge Echinocactus platyacanthus barrels up to 80cm across, and various other cacti. Further on and up we climbed again into the mountains, and into an area dominated by dwarf Pinyon pine forest. At a glance Pinus cembroides and its associated flora give a feeling of being somewhere in the Mediterranean, though on closer inspection one finds the shrubs and herbaceous layer altogether different and composed of a mix of fascinating things. Many legumes, Zanthoxylum sp., Mahonia sp., blue leaved Dasylirion glaucophyllum with weeping foliage, and even Mamillaria cacti in flower, the latter reminding one just exactly which side of the pond we were. I even stumbled across a stick insect. That was a first. Another day took us, as ever, into another new experience of the moist tropics, before we turned back into the semi-desert. This time we were spending lunchtime with the Mexican Swamp Cypress, Taxodium mucronatum in an exquisitely beautiful, warm and humid area near Ciudad Valles, and as the sun was setting we were standing amongst acres of single stemmed tree Yuccas West of Ciudad del Maiz, San Luis Potosi. They were Y. carnerosana, a truly impressive beast with thick trunks and broad, rigid leaves radiating evenly from the apex, with a tangle of filifers peeling from the leaf edges. 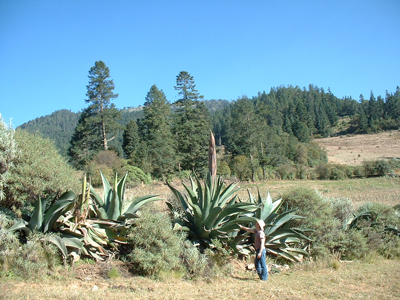 At our feet were countless thousands of Agave striata, Hechtia sp, and Agave americana subsp. protamericana, the latter being the true wild form of this commonly cultivated species, and with an attractively banded colouration on the leaves at this location. Our most northerly point reached on this trip was one of the highlights of the entire journey. The mountains above Miquihuana in the State of Tamaulipas are fabulously beautiful and full of botanical treasure, not least the truly wonderful Agave montana. As we approached this area, we had the pleasure of passing thousands of venerable and sometimes quite sizable Dasylirion quadrangulatum, looking very similar to Xanthorrhoea species, the ‘Black Boys’ or ‘Grass trees’ of Australia. Above the town of La Peña D. quadrangulatum was joined by the rare Dasylirion miquihuanensis and an unidentified trunk forming Nolina species, known so far by the few Texans who have shown an interest as Nolina ‘La Siberica’. As we gained altitude the vegetation turned from semi-desert to temperate pine and oak, with various unidentified Quercus species lining the track, one only a couple of feet high with tiny leaves and acorns only a centimetre long, another a little taller with brown felt-backed foliage. As we hit the Pinus hartwegii zone we knew we were at high altitude, and around 3000m we were surrounded by the most awesomely beautiful Agave you could ever hope to find. This is the home of Agave montana, a species only recently split from the variable A. macroculmis complex (the latter name is now a synonym of A. gentry). The single, non-suckering rosettes reach a size of approximately 1.5m wide by 1m high and are simply beautifully formed, being composed of innumerable and variably armed leaves, often exquisitely coloured with a white bloom and marked with striking bud imprints, the teeth sometimes being bright red-brown. The whole effect is of a giant Sempervivum in the most extreme plants. They were highly variable, making for a fascinating mixed bag, and endless photo opportunities. One of the most exciting things about Agave montana is that apart from being one of the most handsome and distinct in the genus, it is most probably going to prove one of the easiest to grow in cool, moist climates, such as that of the UK. The area in which it grows is renowned as one of the coldest in Mexico, but more importantly it has a comparatively high rainfall. Our last couple of days saw us exploring the volcanoes around Mexico city, where 2m high Eryngium alternatum and the mighty Agave relative Furcraea parmentieri were both seen in full bloom. This was a fitting finale to a richly rewarding botanical tour, and one which left us feeling we had only scraped the surface of this fascinating country. incredili immagini!complimenti per questo bel sito, adoro la vegetazione tropicale di montagna. Qué bonitas fotos, me encantaron. Sin duda mi México es una maravilla. ¿Has venido a Oaxaca? Si no, ¿Qué esperas? No te arrepentirás.